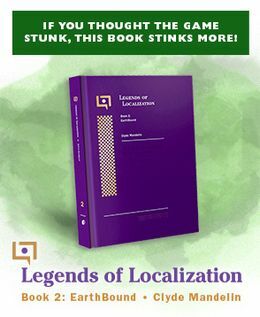 During the EarthBound Bash, Marcus Lindblom mentioned to me that he had wanted to write a book about his experiences working on EarthBound’s localization back in the day, but that Nintendo basically said no and killed the idea. Well, Polygon has a new article that goes into a little more depth on the subject, check it out here. One of these days/years I finally hope to release a book version of my EarthBound/MOTHER 2 localization comparison, which would go into deeper detail than the online version and include some new content. So if Nintendo’s against Marcus’ book, maybe he can eventually piggyback on mine somehow 😛 That was always sort of my plan anyway – for the book versions of my Legends of Localization stuff I’d try to hunt down the people responsible and interview them. Anyway, all that aside, if you want to keep up with Marcus’ current adventures and work, you can follow him on Twitter here! They should let it happen… they’ve released stuff like this for other games… but why not EarthBound? If he really doesn’t want to make money from a book he should slowly post articles deep in the starmen forums where few sane people venture. Or write a blog under a false name about a fake game called world destination or something not stupid. nintendo needs to ease up on their copyright and ip stuff. This book wouldn’t have hurt nintendo 1 cent, and maybe even would have made them money through publicity. They can’t censor him from writing about his experiences. If he wanted to write directly about Earthbound, he can do so via the internet on a blog or similar site as long as he isn’t making money from it. 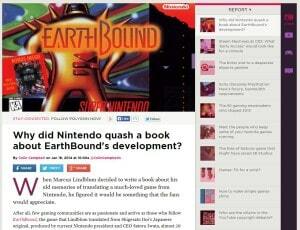 If he wants to publish a book, he can do so, but without advertising that it’s a book directly about Earthbound. Nintendo aren’t necessarily greedy or trying to control their intellectual property as much as keeping their name safe. He could write the book and submit it to Nintendo for approval, which they may still reject, but I think Nintendo probably fears that he might write something that the public shouldn’t know or may put them in a negative light. As much as I love Nintendo, and I did buy a Wii U despite there not being many games as well as Earthbound off the Virtual Console despite playing it via a rom, they do tend to be very conservative and keep a certain image. I bet you they’re still scratching their heads over Earthbound being one of the best selling and top-rated games of the Wii U. Even back in the nineties, it was a different sort of game for them, and I think they published it more out of respect for Itoi’s art rather than the hopes to make millions. Despite Earthbound’s modest sales, they still published Mother 3, which speaks volumes about them, but I don’t think they understand the public’s interest in wanting to know how these games were developed. How much do we really know about classics like Link to the Past or Super Mario 64 beyond what they allowed published through interviews and press releases? To Nintendo, the final product should do the talking. Not sure what people don’t understand. An NDA is an NDA. No matter how many years have passed or how stupid it is, you can be sued for talking about it and you will lose. I’m a translator here in Japan and have had to sign countless NDAs. It’s a shame, but Nintendo’s right to enforce it. I would buy and read the book without a second thought. Jason, Nintendo has A right to enforce their NDA but it is most certainly NOT right for them to enforce it. Again, he can write a book about his experience as a translator and relate stories about Earthbound, but he can’t advertise it as such. I’d love to see a case where Nintendo sued someone for writing a non-profit blog, website, or related articles. It would be very informative. I don’t get why they would have a problem with him doing the book. Wouldn’t it just be like free advertisement for them? NDAs also apply to news interviews. You need not do it for profit to violate an NDA. Jason, if you can provide sources, such as lawsuits that Nintendo filed against employees, it would be very welcome. I’d also like to see an example of a Nintendo NDA and what they entail, and if the translator signed one for Nintendo, and I’d like to see it the contract is still valid.